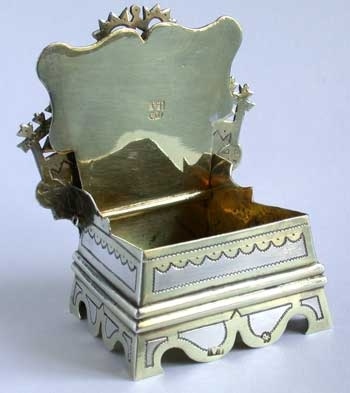 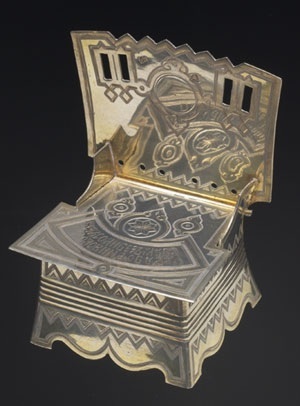 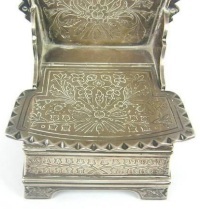 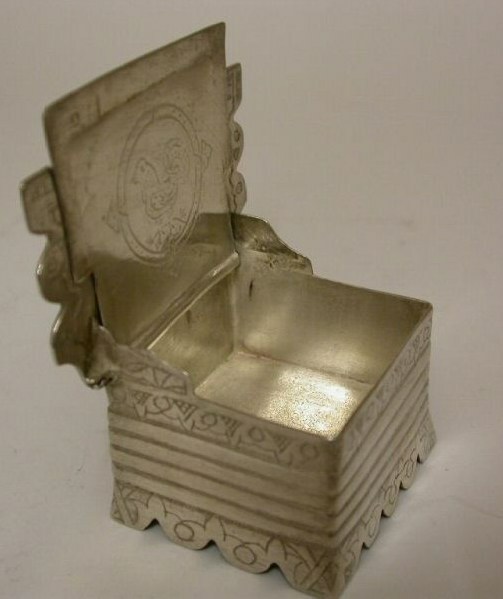 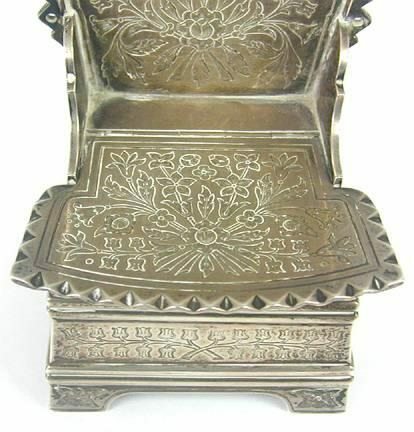 The silver 'salt throne' is a traditional object of Russian culture. 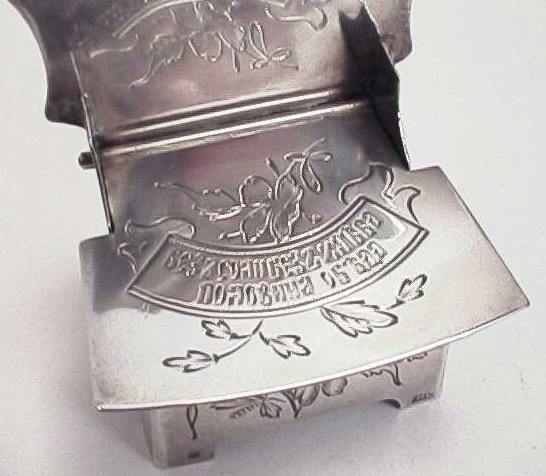 Nevertheless its use was limited to a relatively short period: the more ancient are dated around 1845-50, while their production ceased with the Bolshevik revolution of 1917.
and a few examples made of birchwood of Karelia (on the right). 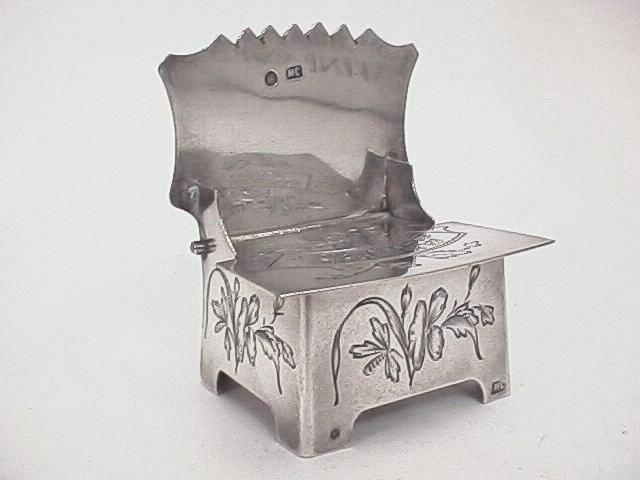 In Russia the salt cellar was kept at the entrance of the house and a piece of bread dipped in the salt was offered to the guest as a symbol of welcome. Otherwise the 'salt throne' had the place of honour on the table. A small piece of bread was leaned on the seat (at the center of the throne) and the guest dipped the bread in the salt inside the throne. 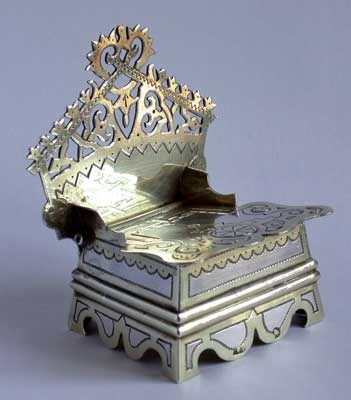 The back of the throne evokes the classic isba, the small wooden house of Russian rural architecture, which you can find nearly anywhere in the northern part of that country: the sharp-ended roof, the crossed beams and the gable with obvious reference to the house as a symbol of familiar affection, while the geometrical decorations symbolize the perfection of the marriage union. 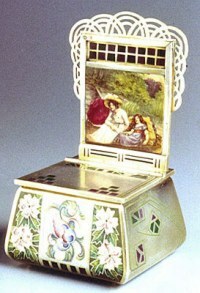 The salt cellar, presented to a young couple on the occasion of their marriage, meant 'Best wishes' or 'We wish you well'. 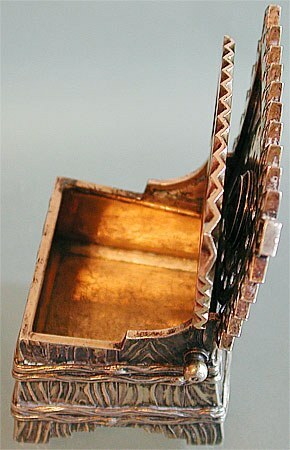 Holes on the back of the seat represented the windows on the house front, while the superior edge evoked the characteristic undulating finish of Russian 'isbas'. 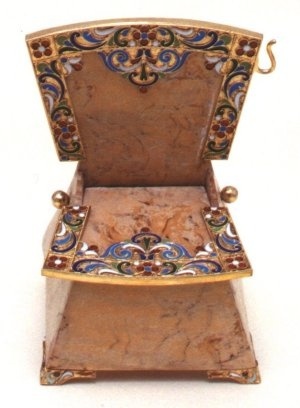 The back side of the throne has usually a most refined look as, opening the salt cellar, the view of the front side is covered by the seat. 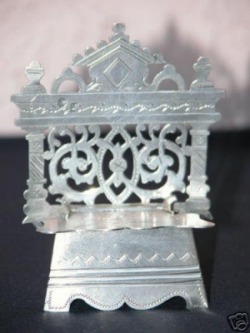 Since the ancient ages and in all the cultures the salt is a symbol of life and immortality, faithfulness and friendship. 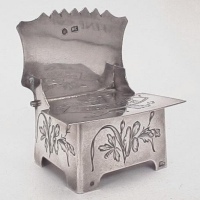 The offer of salt was a common practice among Arabic people, in Northern Africa and also in Southern Italy (while in Tuscany a bit of bread with a drop of oil was usually offered). The bread evokes fertility and nourishment, both for the body and the soul. 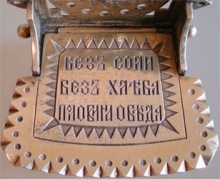 Breaking the bread and touching it on the salt represents and wishes a harmonious and long lasting friendship. 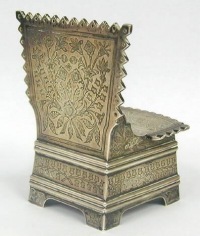 Often on the back of the throne or on the seat there were phrases expressing best wishes or good fortune: 'Eat bread and salt but also follow good advice' or 'Without bread and salt, the meal is not complete'. Sometimes, a rooster, symbol of fertility and love, is represented on the throne. 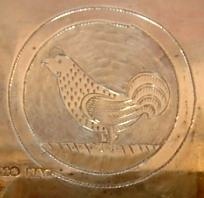 However this omen is not flaunted and appears only when the salt is opened (it is engraved on the underside of the seat). 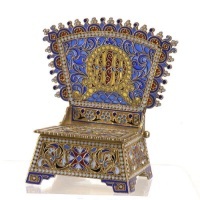 The silver salt throne is an item highly appreciated by collectors and items available for sale are always rare. Obviously their prices have risen and some 'fakes' are offered for sale on the antiquarian market (objects of modern production, mostly cloisonné, with fake hallmarks of Tsarist Russia).